Surgery to fuse the lumbar spine. 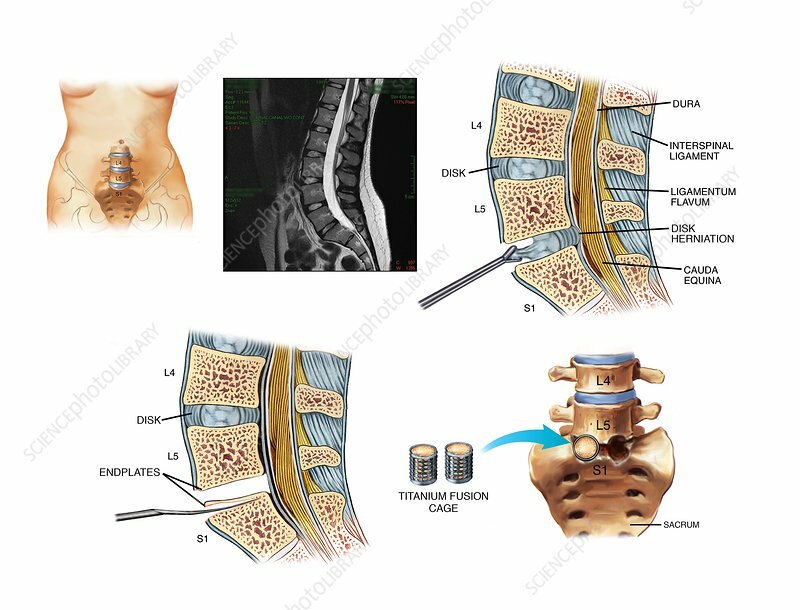 Sequence of artworks of an operation to replace an intervertebral disc with implants. This procedure, taking place in the lumbar (lower back) region of the spine, is known as an anterior lumbar discectomy. At upper left is the L5-S1 joint seen from the front. At upper right, the sagittal view (with corresponding MRI scan at upper centre) shows disc removal. After disarticulation of the vertebral endplates (lower left), two titanium fusion cages (lower right) are inserted into the space. These cylindrical screw implants are filled with morphogenic protein bone sponges, a material that promotes new bone formation.